(Nanowerk News) What to do proteins and Kevlar have in common? Both feature long chain molecules that are strung together by amide bonds. These strong chemical bonds are also common to many other naturally occurring molecules as well as man-made pharmaceuticals and plastics. Although amide bonds can give great strength to plastics, when it comes to their recycling at a later point, the difficultly of breaking these bonds usually prevents recovery of useful products. Catalysts are widely used in chemistry to help speed up reactions, but breaking the kinds of amide bonds in plastics, such as nylon, and other materials requires harsh conditions and large amounts of energy. Building on their previous work, a research team at Nagoya University recently developed a series of organometallic ruthenium catalysts to break down even the toughest amide bonds effectively under mild conditions (Scientific Reports, "Multifaceted catalytic hydrogenation of amides via diverse activation of a sterically confined bipyridine–ruthenium framework"). “Our previous catalysts could hydrogenate most amide bonds, but the reactions needed a long time at high temperature and high pressure. 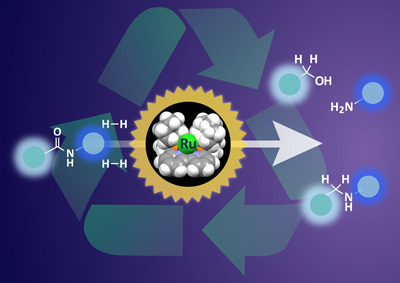 This new ruthenium catalyst can hydrogenate difficult substrates under much milder conditions,” says lead author Takashi Miura.